A. An abandoned building in a remote, woodsy area, perhaps a state park. Dexter refers to it as "an old tourists' welcome center". A. Somewhere on Boyd's patrol route, "out on County 5", in or near Miami. A. In Episode 3, of Season 5, "Practically Perfect". Dexter is planning to kill Boyd Fowler, a serial killer who had been murdering young women and dumping their bodies (in barrels) into a swamp. In this scene, we watch as Dexter finds his "kill room" for Boyd. He drives to what appears to be an abandoned building out in the middle of nowhere, in the woods. He says that it used to be a visitors welcome center, but we see that it is now closed and surrounded by a high chain link fence and "No Trespassing" signs. "Not very welcoming now," Dexter muses. He scales the fence and, inside the cabin, begins to build his kill room. Harry appears and questions Dexter about the wisdom of killing Boyd in the daylight. 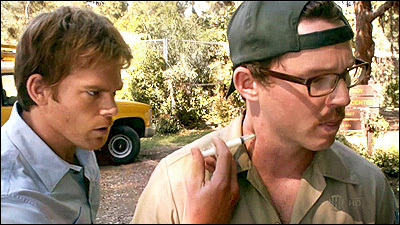 Later, in the same episode, Dexter phones in a fake report of an alligator and lures Boyd out to this cabin, where he does his usual pre-kill routine of injecting Boyd with a sedative. But what he doesn't count on is that Boyd (a dead animal pickup guy) is carrying an animal tranquilizer gun, and when he realizes Dexter has attacked him, he fires a dart into Dexter's midsection. Both of them wake up in an ambulance on the way to the hospital. In the next episode, "Beauty And The Beast", Dexter takes Lumen (the young woman he saved from Boyd) to the same isolated cabin. Since she saw him kill Boyd, he has to decide what to do with her.... So he winds up sort of holding her captive. She attempts to escape, and almost makes it, but when she hesitates to get in a car with some rowdy boys, Dexter catches her again. A. 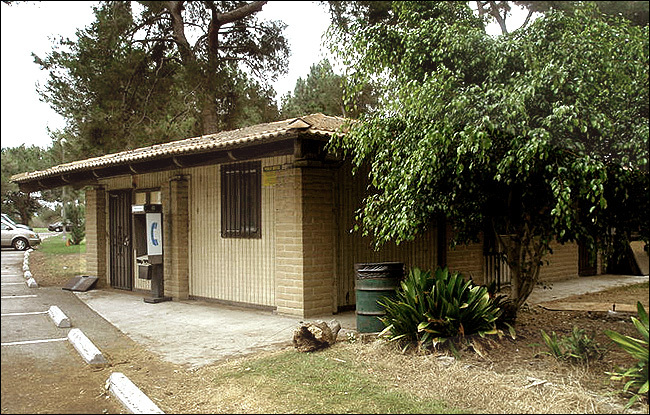 A park ranger station. A. 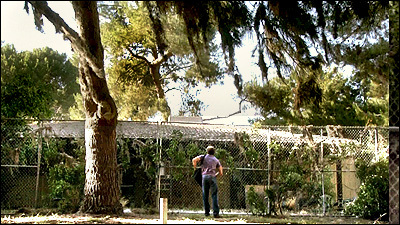 This scene was shot in El Dorado Park, in Long Beach, near the same spot where they filmed the scene of Dexter jogging (after a teenage killer) in Flamingo Park. The park's official address is 7550 E. Spring Street, but this scene was shot in the northern section of the large park, north of Wardlow. The building is actually small ranger station, on the west bank of the big lake there. The wooden bridge we see Dexter drive across, just before he sees the center for the first time, actually crosses a stream that joins the big lake with a smaller lake to the north. It's location about 300 yards northeast of the ranger station. That same bridge is seen later in the next episode, when Dexter chases after an escaped Lumen. 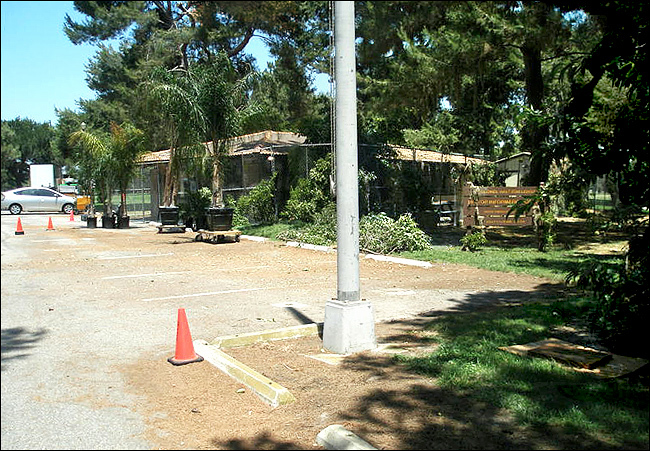 They have filmed several times before at this El Dorado Park. 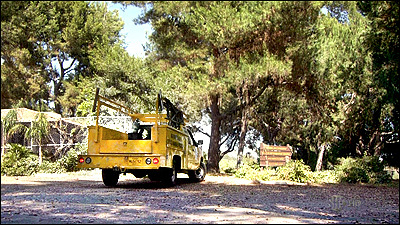 In the 4th season, it's where they filmed the scenes of Dexter's car crash. Later, in the same season, it's where Trinity's car breaks down for the last time. 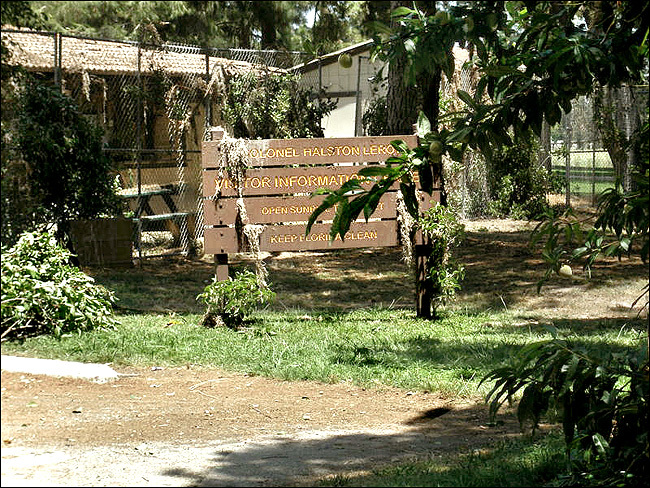 In the first season, they filmed that Flamingo Park scene by the lake, and they shot an everglades scene, with an alligator, at the park's Nature Center. ranger station actually looks like, without all that chain link fencing. Here is an aerial photo of the ranger station. And here is a map link. A. In previous seasons, I've usually had to hunt down the locations after viewing the episodes, using clues from the various scenes. By the 5th season, though, I'd developed a small group of fans, spies & tipsters who kept an eye out for Dexter filming in their neighborhoods, and would let me know in advance when something was about to film there. Between those reports, and my own personal reconnaissance around town, by the time the first episode aired, I already knew most (but not all) of the filming locations, and only needed to watch the episodes and match up the scenes with the correct locations. This group of helpful fans includes Kerry, Rick, Joel, Geoff, Ellen, Julie, Susan, Jeff, and others. My thanks to all of them. This particular info came from Kerry, a fan who lives near the park. (She's the same tipster who got the photos of the roll-over accident last year at the park, and who managed to land an extra role on the show for the arcade scene with Trinity & Dex).